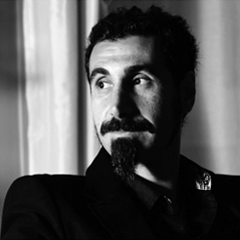 Perhaps best known as the lead vocalist for Grammy Award winning rock band System of a Down, Serj Tankian is also a composer, record-producer, visual artist, and activist. Born in 1967 to Armenian parents in Beirut, Lebanon, Serj moved to California with his family as a child. Today, he’s widely considered one of the greatest vocalists in metal history. Since his success with SOAD, Serj has gone on to release critically acclaimed solo-albums, launch his own record label, create musical scores and compositions for films and video games, and co-found a non-profit organization, Axis of Justice, with Rage Against the Machine/Audioslave guitarist Tom Morello. In addition to his activism for social justice and human rights, Serj is an environmental and animal protection advocate.